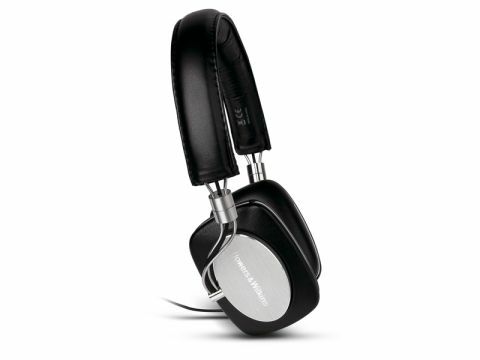 So here it is: Bowers and Wilkins' first-ever hi-fi headphone. Designed for 'mobile' use, the P5 is squarely aimed at the quality conscious music lover, so there's no need to eBay your 'home-use' Sennheisers and Grados just yet. The promise of Bowers and Wilkins' sound quality, build quality and legendary performance, however, may make the P5s a natural addition to the (travelling) audiophile's kit list. The P5 is a closed-back, super-aural (on-ear) headphone that benefits from a good degree of noise isolation, thanks to its cleverly designed sealed ear pads. Coupled with a snug fit, the P5 does a great job of cutting back on intrusive background noise. The diaphragms are 20mm Mylar types, supported by 'specially developed' neodymium magnets and the listed stats are impressive: 10Hz-20kHz response; 115db sensitivity and just 195 grams in weight. Usefully, the P5s fold flat and its cable incorporates a mic and a remote control for Apple iPhone/iPod users, allowing speech and device control and boosting the on-the-go credentials. The leather-faced headband is adjustable and the single-sided cable is detachable – cleverly, the ear pads are magnetically attached and can pop off to give access to the wire beneath. Notably, Bowers and Wilkins' places great importance emphasising the P5's suitability for long-term listening without fatigue, and to this end, the engineers have strived to keep the balance as neutral as possible. Perhaps the most striking aspect of the P5 is the design and standard of build. The looks were influenced by the early headphone styles seen in Abbey Road's photo archives and it's clear the company has worked hard on the details. You can 'smell' the quality before they're out of the box – the New Zealand leather used is very impressive – soft, supple and pleasure in use. Build quality is difficult to pick fault with and combined with the iconic design, the P5 gives a genuine pride of ownership that doesn't always come naturally with a lot of other marques. Only time will tell if the flimsy looking cable and the soft, luxury leather will cope with day-to-day travelling, but the P5 has been designed with mobile use in mind. At £250, the price isn't prohibitive, but it's not insignificant for a mobile-use product. Some of our favourite 'home-use' cans sits beneath this price point, but the P5 has few, if any, upmarket 'mobile' rivals to draw comparison with. The performance is extraordinary. The parallels between the P5's sound and the perceived Bowers and Wilkins' 'house sound' are all here. First of all they love to play loud and just like many of the company's speakers, they perform best at high volumes, so you need to be careful! They are also composed, beautifully balanced and unquestionably natural, although at times we craved a bit more sparkle in the treble. Our sample improved with a 60-hour run-in period and got better with time. Although, we experienced no fatigue in long-term listening from the drive units, we did find the snug fit led to some discomfort on our ears. The flip side, however, is that the noise isolation is highly effective, drowning out all but the loudest Underground lines. Leakage is kept under control, too with the closed-back, so other than pure jealousy, you won't upset your fellow passenger. The acid test is whether as a reviewer you want to go back to what you were using before. We didn't. For a debut product, Bowers and Wilkins has done a fine job. Retaining the house sound is a credit to the engineering team and the fabulous design touches and obvious build quality strengths make the £250 tag seem, well, fair. Try them for comfort first, but then buy with confidence.